We Are Not Ranking Well These Days! Two somewhat similar religious/church studies have come to my attention in the past week, and our area and the state of Maryland does not score well in either. The first is a Barna Research Group look at how the Bible is viewed in 96 geographical areas of the country – around major cities. 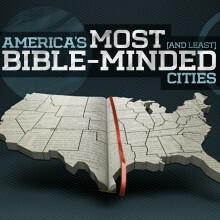 It ranks the most and least “Bible-minded” cities by examining how people in those urban areas view the Scriptures. The research asked about how much people use the Bible, as well as how much they value its authority – thereby reflecting the overall openness or resistance to God’s Word. Cities and urban areas in the top 10 were: Knoxville, TN (52% of the population is Bible-minded), Shreveport, LA (52%), Chattanooga, TN (52%), Birmingham, AL (50%), Jackson, MS (50%), Springfield, MO (49%), Charlotte, NC (48%), Lynchburg, VA (48%), Huntsville-Decatur, AL (48%), and Charleston, WV (47%). At the bottom of the list were Providence, RI (9%), Albany, NY (10%), Burlington, VT (16%), Portland, ME (16%), Hartford, CT (16%), Boston, MA (16%), San Francisco, CA (16%), Phoenix, AZ (17%), Buffalo, NY (18%), New York, NY (18%), Cedar Rapids, IA (18%), and Las Vegas, NV (18%). So where was Hagerstown? Well, we were grouped as “Washington D.C./Hagerstown” and ranked 63rd at 25% … not so great. I guess it can be argued that the District dragged us down! The other listing that caught my eye was written in an article called 493 Churches to Watch in 2013. This was actually a compilation of 22 lists of U.S. churches since 2004 that have been chronicled as the largest, fastest-growing, and best known for influence, innovation, or church planting. I am sorry to report that Tri-State Fellowship did not make the list. However, nothing remotely close to us made the list either; and there were only a handful of Maryland churches – mostly ethnic congregations – from the Baltimore and D.C. area in Md. Probably the closest to Hagerstown of any church on the list is McLean Bible Church in Virginia. This is not the easiest area in which to minister, but there sure are a lot of people to reach out to with the truth! This entry was posted in The Crazy Culture / Odd Stories, Tri-State Fellowship. Bookmark the permalink.